2nd prize in the non-open planning competition with five participants. The new Franklin district is under development on the former US army grounds north-east of Mannheim’s city centre since 2016. 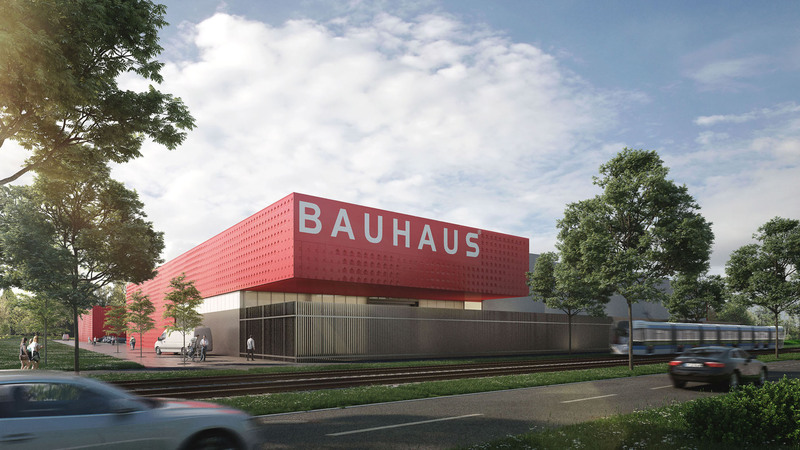 In the commercial Columbusquartier at Bundesstraße 38, a new Bauhaus store is to be built. The facade design is based on the distinguished design principle developed by DFZ Architekten in 2009 for the Bauhaus store in Bremen and already implemented in Bremen and Hamburg. The basic elements consist of red aluminum panels (60 x 60 cm) embossed with a three-dimensional imprint of the company’s house logo in four different sizes. The panels are arranged so that, from a distance, the company’s logo appears in a large format on the building’s facade. Through this play with close-up and long-distance effects, the corporate identity is presented in an abstract way, resulting in a building envelope with a strong identity. 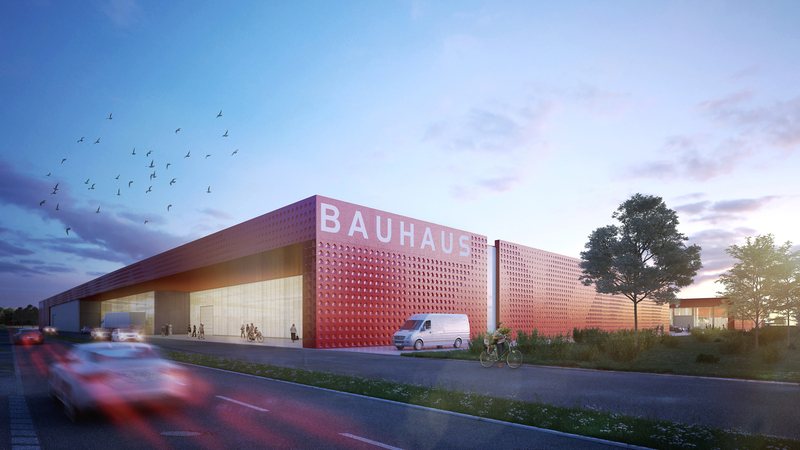 To emphasise the entrances, the red panel facade is combined with glass, polycarbonate, aluminum, and white plaster. The facade is an insulated steel cassette construction which allows for modular and rapid construction. In order to maintain the uniform appearance of the entire area, advertising elements can be integrated into the facade and do not have to be distributed individually on the site.